Dry-Treat is the world leader in the production of sealers for porous surfaces, such as natural stone, tile, paving, concrete and grout. The chemistry of Dry-Treat's impregnating sealers is unique, giving superior penetration and permanence, for unsurpassed protection. Benefits: STAIN-PROOF Original™ is able to repel stains, graffiti and food products making cleaning easier; non film-forming; able to work without changing the appearance of the surface - keeps the original look; suitable for indoor and outdoor use; able to greatly reduce water uptake and minimise moss growth, freeze thaw spalling and efflorescence; an excellent chloride ion salt screen, ideal for marine and pool areas; highly water vapour permeableable to breathe so there is no build-up of subsurface moisture, allowing it to dry out; deeply penetrating protecting against weathering and wearing; very alkali resistant; won't break down in contact with cement based materials, able to seal hairline cracks up to 0.3 mm (0.012 in.) and does not flake or peel. 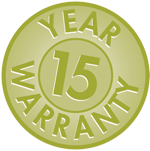 Warranty: A 15-YEAR PERFORMANCE WARRANTY is offered when product applied by an Accredited Applicator following our written instructions and surface is maintained regularly using our written maintenance system, as outlined in our warranty document. Spills should still be cleaned up immediately to minimise absorption.